You will earn 1,355 Reward Points. Earn 1 reward point for every 1 dollar spent. • Each compartment is fitted with a 500-watt or 750-watt tubular element above the insulated bottom. 500-watt element is standard on units wired for 110-120 volts; 750- watt element is standard for units wired for 220-240 volts. • A six-foot (1829mm) cord with plug extends from the bottom of the right hand control side as standard equipment. • 120-volt models are single phase. 240-volt models available in single- or three-phase. • Table body and top are constructed of highly polished 22 gauge 430 series stain less steel. • Top features die stamped beaded openings measuring 123 ⁄32˝ x 203 ⁄32˝ (307 x 510mm). • A poly cutting board, 8˝ (203mm) wide and 1 ⁄2˝ (13mm) thick, is mounted on drop brackets located on control side of unit, allowing movement through standard doorway. • Legs are 15 ⁄8˝ (41mm) O.D. tubing fitted with 4˝ (102mm) diameter NSF certified ball-bearing casters. • All models are 301 ⁄2˝ (774mm) wide and 34˝ (863mm) high. • Units feature 1˝ (25mm)-wide push bar attached to the end panel at operator’s right. 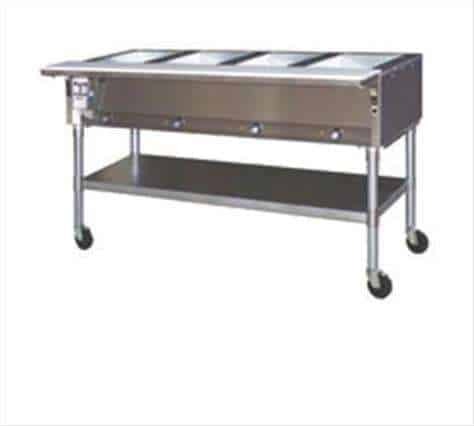 Eagle Hot Food Tables, open base design, model PDHT4-240 . Top and body to be heavy gauge type 430 stainless steel. Beaded top openings to be 123 ⁄32˝ x 203 ⁄32˝. Heating compartments to be 8˝-deep, galvanized, and insulated on all four sides and bottom with 1˝ fiberglass or equal. Recessed control panel with individual infinite controls offer high and low settings. Each compartment fitted with 500-watt heating element for 120-volt units, and 750-watt heating element for 240-volt units. Six foot cord and plug extends from the bottom right hand side of the unit. Furnished with polycarbonate cutting board. Legs to be 15 ⁄8˝ O.D. tubing, with adjustable undershelf and 4˝-diameter casters. • Individual infinite controls offer high and low selections along with eight other temperature settings. • Indicator light remains on continuously while control is in “ON” position. • Each heat compartment is 8˝ (203mm) deep and lined with 22 gauge galvanized steel. • Each compartment is insulated on all four sides and bottom with 1˝ (25mm) thick fiberglass or equal.